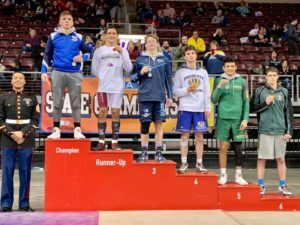 Safford High School is no stranger to the top step on the wrestling podium. Now you can add two more names to the Mt. Rushmore of Bulldog Wrestling. 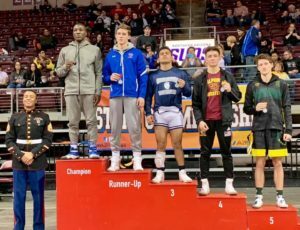 McKade Finch and Dawon Andrews completed the rare high school career sweep as they both won their 4th wrestling State Championship on Friday night in Prescott Valley. Finch dominated the 138 pound Division 3 bracket. He finishes his senior year with a 53-2 record. Andrews pinned all four of his opponents in route to his 4th state title. He finished his senior season with just one loss. Safford had three other wrestlers place in the top six as well. 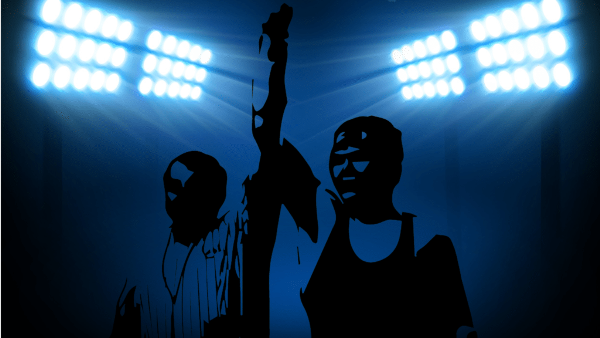 Thomas Kinnebrew went 4-2 in the State Tournament and finished 5th in the 106 pound bracket, Briggs Baldwin finished 3-3 in the 182 pound division and finished 6th, Robert White went 3-1 and suffered his first loss of the season in the 170 championship match and took home 2nd. He had pinned his first three opponents before the final match. Safford finished 5th in team points with 107.5. Walden Grove won the Division 3 Team Championship with 185.5 points.